Forget the tarmac, get off road with an off road buggy experience. Perfect for adrenaline junkies, jump in the driver's seat of a dirt buggy and let those nobbly tyres do their job as you take on purpose-built dirt tracks with challenging corners, tricky chicanes and high-speed straights. View the full range of off road buggy driving experiences below. What is an off road buggy experience? If you're after a driving experience that offers thrills, spills and most importantly, MUD then our Off Road Buggy Driving Experiences are exactly what you are looking for. Off Road buggies are made up of a light weight frame with exceptional suspension, so combined with a high-powered engine gives them the ability to travel at high-speed on rough terrain. Their large tyres allow them to grip to even the muddiest and wettest of surfaces as well as tackle steep inclines. 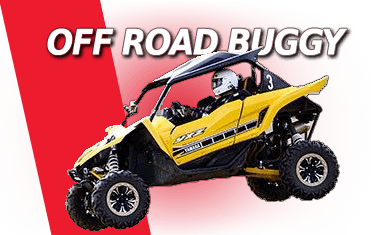 We have a wide range of off road buggy experiences at various centres in the UK as well as a great variety of vehicles. From the 3-seater ATV Yahama Viking where you can tackle almost any type of terrain with a passenger to the unhinged rage buggies which can reach speeds of over 60 mph whilst getting airborne over jumps. Can I drive an off road buggy? We can cater for individual’s customers that want to just have a go up to large groups such as stag and hen parties or corporate days. A typical package for one would include some kind of briefing or tuition session before you then have a drive yourself. For large group bookings it is possible to have an exclusive off road buggy event where you have the event and the buggies to yourself. The other great thing about taking part in a buggy experience is that in most cases you do not have to have a driving licences. There are packages available for 14 years old and upward and with instructors to hand on the day they will be driving in a safe environment. Driving a buggy is much less complex that driving a car so people of any experience can take part and it will not be long before they get a real feel for what the vehicles are capable of. Being a good driver already will certainly mean you will have a fantastic experience and you will quickly find out that the faster buggies such as the Yamaha YXZ1000R defy what you believe is possible. Buy one of our amazing off road buggy gift vouchers today and the recipient will have 10 months (unless stated otherwise) in which to book themselves in. Generally the experience run all year round with plenty of availability. If you are looking for something bespoke or wish to book directly onto a date then contact our sales team.